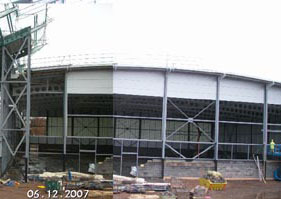 Both areas are now completely covered; all external cladding and lower level brickwork are complete on the martial arts area and days away from being complete on the gymnasium. A total of 10 days of building works have been lost since the start of the build due to bad weather. However, it is envisaged that this can be made up and the build is still on schedule. The central raised area will house 1st floor balcony, kitchen, relaxation area, meeting room and office space. The angled roof is a bio-diversable space which will mean that it will have a living green space growing grass. This will give a continued green eyeline to those residents housed opposite to the GMAC centre and greatly lesson any apparent harshness of the centre in the park area. Installation of windows, external doors and screens are due to start over the next weeks along with first fixes of mechanical and electrical works.